War is hell, and the apocalypse is now. In this action-packed war challenge, you are an attack plane pilot fighting on the front lines against the mad Fuhrer and his Nazi storm troopers. It is up to you, one of the last wings of the resistance, to stage your own blitzkrieg and win the war. The future rests on your shoulders, and if you're going to secure liberty and justice for all, you need to shoot, bomb and fire rockets deep into enemy territory. The stakes are high in this war game, but the gameplay is easy. Sky Fire provides hours of addictive fun for gamers of all levels. Use the mouse to control the direction of your plane, and click the mouse to fire on the enemy. 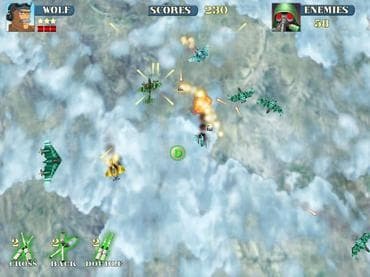 However, you're going to need to dodge and evade enemy fire, so you better be able to navigate your plane like a pro.Featuring blistering action, realistic graphics and a pulse-pounding soundtrack, when you download this free game it will feel like 1944 all over again. Download free full version game today and start your battle! If you have questions about Sky Fire game, please contact us using this form.